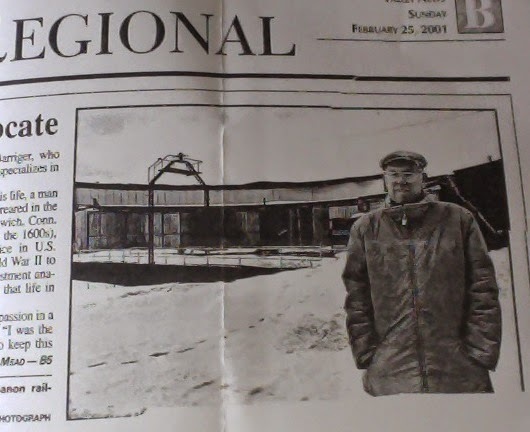 Valley News: Sunday, February 25, 2001. HANOVER- He'd made a career in the pinstriped world of Wall Street. He was a prolific letter writer, a dying breed these days, who seemed to pop up in this newspaper almost as often as the weather report, opining on politics, local government and a host of other issues. He served in numerous local boards and co-founded a political think tank in Concord. But Edgar T. Mead Jr., who died Thursday at 78, was first and foremost a railroad man, a passionate authority on the rails and transportation issues, including in northern New England. "He had worked as a teenager on the road in Maine, and he'd gone to camp in New Hampshire," says his son, E. Thorn Mead III. "He had some ties (here). He knew the north country." Indeed, the man who produced 14 books and more than 100 articles on railroads, transportation and economics devoted his first book, Over the Hills to Woodstock to the old White River Junction – Woodstock line. "He was quite, quite well known among (rail) fans, kind of in a senior position" among buffs, said Stanley Barriger, who owns Ascuntney Travel, which specializes in railroad travel. He was, for more than half his life, a man of the city. Born in New York, reared in the tony Gotham suburb of Greenwich, Conn. (a town his family founded in the 1600s), Mead came back from service in US Army intelligence during World War II to work on Wall Street as an investment analyst. But when he retired from that life in 1968, he moved to Hanover. Explaining the genesis of his passion in a 1998 interview, Mead recalled, "I was the child of much older parents. To keep this little kid busy, the train is the thing to look at. So we went for a week or two down to Atlantic City. My father found a grade-crossing guy who'd lost a leg and had this kind of sinecure job. He just loved kids, so I and he would sit there and talk, and all the trains were coming out of Atlantic City every 10 minutes. And these (different trains) became all very clear to me. (I also) think my father was kind of a closet rail fan. He'd take me to see trains go by. Then we had a cousin in Denver who was chairman of the Denver – Rio Grande River Railroad. And he and I were great pals." While on Wall Street, Mead specialized transportation stocks. The colorful, robber-baron history of railroads also appealed to his romantic streak. He'd eagerly recommend a book by Winston Churchill (the American, not the British prime minister) on the construction of the Concord-Claremont Railroad, the charter of which was rammed through the state legislature when a storm prevented many appointments from reaching Concord. He is survived by his wife, Emily; three children, E. Thorn Mead III of Marblehead, Mass., Mary Mead of Warner, N. M.H., and Malcolm W. Mead of Harding, N.H.; and six grandchildren. A memorial service will be held Saturday at 2 p.m. at the St. Thomas Episcopal Church in Hanover. A reception will follow at the Center on the Dartmouth College campus. Memorial donations in his memory may be made to the main Narrow Gauge Railroad, 53 4th St., Portland, Mane; or to St. Thomas Episcopal Church. Edgar T. Mead, Jr., 78, of Hanover, N. H., a retired Wall Street executive and railroad preservationist, died Thursday, February 22, at Health South Rehabilitation Center in Concord, N. H.
The cause of death is still to be determined, his family said. He was born Dec. 12, 1922, in New York, son of the late Edgar and Gertrude Hayward Mead. He grew up in Greenwich, which counts is forebears among its founders. He attended Greenwich Country Day School and Choate School. After graduating from Williams College and serving with U.S. Army Intelligence in Europe during World War II, he worked for several Wall Street firms, including Moody's Investor Service, and attended and taught at New York University Graduate School of Business Administration. He subsequently joined the investment firm of G. C. Haas & Co., from which he retired as a partner in 1968. Moving to Hanover, N. H., he took over as director of the Steamtown Foundation in Bellows Falls, Vt, one of the nation's premier preservation sites for steam-era railroad equipment. He was later appointed director at the New Hampshire Transportation Authority, serving from 1974-76. Railroads, particularly steam trains, were the theme that unified Mr. Mead's personal and professional life. He traveled the world in search of disappearing steam railroads in the 1950s, '60s, '70s, and '80s. He was particularly interested in narrow-gauge steam, passion which was captured in a number of books he authored, including 'Busted and Still Running' and 'The Bridgton Narrow Gauge.' He stepped in on numerous occasions to purchase steam locomotives from the scrapper's torch. Mr. Mead served as a delegate to the 1974 New Hampshire Constitutional Convention and the 1980 Republican National Convention. He served on the planning board, library and Board of Selectmen in Hanover. With his wife, he was cofounder of the Josiah Bartlett Center for Public Policy, a nonpartisan state policy think tank in Concord, N. H.
He is survived by his wife of 48 years, Emily Mead, of Hanover; three children, E. Thorn Mead III, of Marblehead, Mass., Mary Mead, of Warner N. H., and Malcolm Mead, of Harding, N. J., and six grandchildren. A memorial service will be held Saturday at 2 p.m. at the St. Thomas Episcopal Church in Hanover. A reception will follow at the Hopkins Center at Dartmouth College. The family requests that donations be made in Mr. Mead's name to the Maine Narrow Gauge Railroad in Portland, Maine, or to St. Thomas Episcopal Church in Hanover.